Upper Deck is the exclusive provider of Team Canada content for trading cards and the company has plans to use that in a new way with 2010-11 NHL SP Authentic. There are two autograph cards in set that are definitely different and will have collectors talking, especially those who are lucky enough to pull them. The first card features Sidney Crosby both with the Pittsburgh Penguins and with Team Canada. What makes this card so unique is that he will sign the card on the Pittsburgh Penguins side and the Team Canada signed creating a very unique dual autograph card. Crosby helped bring his country gold as a member of Team Canada. The next card that is sure to get people talking features Upper Deck’s three exclusive spokesmen; Bobby Orr, Gordie Howe and Wayne Gretzky. Upper Deck is the only company that can produce trading cards of these three legends of hockey. In the 2010-11 NHL SP Authentic Sign of the Times Sixes set the three icons will autograph one side featuring them with their respective NHL teams and then autograph the other side featuring them as a member of Team Canada. There will only be six of these cards inserted into the product. I can’t wait SP Authentic has always been my brand of choice…and with the addition of the Team Canada sigs even sweeter…….. 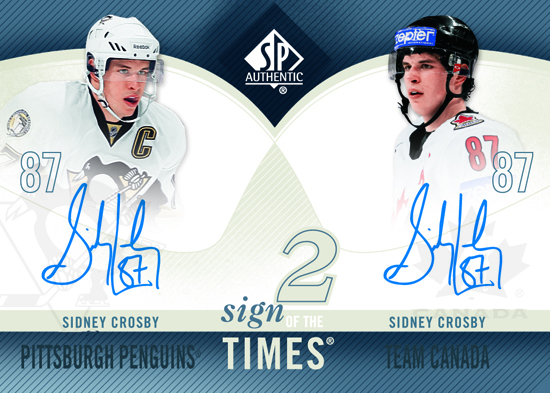 This is the most lame thing ive seen, seriously crosby is so good enough he can sign his own card twice ? for what reason… and that 6 auto card will as usual have stickers.. big wow seems upper deck really making a fool of them now why would u want stickers of 3 players twice ? put in patches on different teams same players thats something cool tho but not autos only. What’s better than a single auto’d card? A dual auto’d card. I think the Pro Team/Canadian Team auto’s are a cool idea. Yes, (referring to Peter) I’d rather have a six player auto’d card rather than a 3 player auto’d card, but at least it’s something new. What’s better than a single auto’d card? A dual auto’d card. Referring to Peter: I would rather have a card auto’d by 6 players rather than 3, but it’s still a cool idea with the Canadian side. Cool. This is really a great find for collectors.